What? Beer drinking athletes? C'mon, Canadians play sports. Canadians drink beer. And Canadians win medals! Get over it. During the Olympics all hell broke loose the night the Canadian women's hockey team took the gold medal in a match versus the USA. Not because they won. No. Because after the game, long after the fans had left, some of them snuck back out onto the ice to finish their dressing-room beers, smoke a cigar and engage in some personal picture-taking. But some sports writer - with a camera of his own - caught the moment for posterity and shared it with Associated Press for all the world to see. The women's hockey team is a class act. And who can blame them for celebrating such a significant accomplishment. Canadian Jan Montgomery won a gold medal hurtling head first down a tube of ice in the men's skeleton event. Long after his win as he walked among the crowd, someone handed him a jug of beer. What would you do in such an event? Throw it to the ground? Of course not. Me, I'd probably do what he did in the moment. He drank half of it down. The next morning he told reporters: I don't subscribe to necessarily all the things typical athletes do. For me, a pint now and then is a good thing." Another class act. Canada had many class acts among their 26 medals - the most ever among winter olympics hosting nations. And 14 gold - more than any other nation at the 2010 olympics. I think, of course, of our first gold medal winner of the games, mogul skier Alex Bilodeau and every medal winner after that including bronze figure skater Joanne Rochette who's mother died only days earlier after arriving in Vancouver to watch her daughter skate. 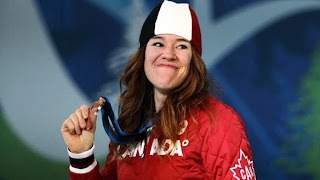 I think, too, of Clara Hughes who won her sixth olympic medal - two summer games medals, 4 winter. Although it was a bronze, the speed skater hopped on the podium and jumped up and down as if it were a gold. A joy to watch. There was a killer of a nail-biter men's hockey match between Canada and the United States that Canada won in overtime on Sidney Crosby's first goal of the tournament. Boy does he know when to let loose. Oh, yeah. President Obama and Prime Minister Harper had a bet on over who would win the game. The prize? 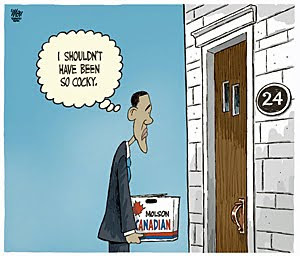 Obama owes Harper a case of beer! No foolin'. And finally, there was my favourite class act. 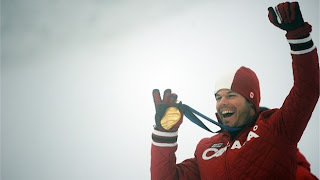 On a foggy, rainy day on Cypress Mountain, Jasey Jay Anderson took the gold in the parallel giant slalom snowboard event. At the age of 35, Jasey had considered retiring before the Olympics, but the guy his young team mates call "the old man" decided he didn't want his tiny daughters to think he was a quitter. Good thing. Another class act. The Canadian team down to every woman and man, medal winner or not, made Canada proud. And I'll drink to that! Amen Sir! They sure made us proud alright! As for having a beer after winning their medals, I say good for them, as the saying goes "Beer, the breakfast of champions!" Aye me Nomie be a proud Homie! Skye: Yeah, what's the big deal? Me-Me: You may have heard the government would like to change the national anthem. I think "Take Off To The Great White North" is a natural. You know what? I'm always up for a good party. I'm all for the beer breakout pulled by the lady's hockey team. The game was over. Time for some celebration. It was controlled and fun and nobody got hurt. Hell yes ladies! Saluuuute! Bottoms up! Don: And they had something to celebrate...they blanked their American counterparts 2-0. Go Canada! Though I agree, I'm not sure if Jan Montgomery had any endorsement deals fall through due to downing half a pint while facing the flash bulbs. Last January, Michael Phelps lost his sponsorship from Kellog's after he was caught smoking reefer, and this was, for the most part, outside of the public eye. 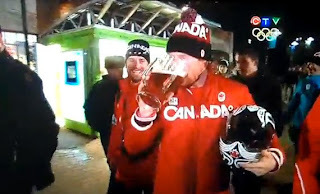 Sure, Canadian athletes drink beer, but if the companies that use them as spokespersons don't want them SEEN drinking beer, because a bottle of Moosehead might sully the reputation of Starbucks or whatever, they'll be dropped from the ads faster than you can say "I don't understand the rules of curling." 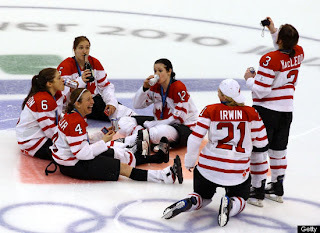 Jeremy: The beer the women's team was drinking was Molson Canadian, which I suspect was provided by the brewer. The irony is the brewery is now owned by an American firm - Coors, which got plenty of exposure from the incident. If I won a gold medal at Vancouver, I'd probably still be drunk. I actually felt more patriotic when I saw those pics. Kate: Lucky for you. Cool. I'm jealous.